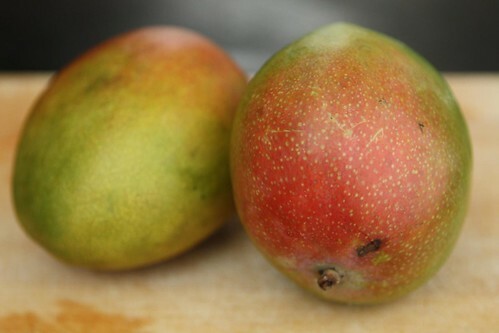 Happy Mango Day! What? 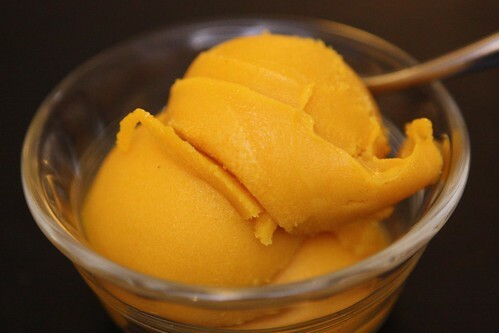 You didn't know it was Mango Day? Jen's currently in week 19 of her pregnancy which means that she is the vessel to two (2) mangoes. Depending on which fruit and vegetable pregnancy tracking tool you use (TheBump.com's Baby Size Chart is my particular weapon of choice) your results may vary. As I understand it, the fetus develops in the womb and each week morphs into a different fruit or vegetable until it has cycled through all known produce and it becomes a human. There are only 21 more types of produce left before our babies finally achieve full human baby status! Now I understand the swelling pride of a new parent. For a starter I made a chopped salad. Generally I like my salads as unchopped as possible, enjoying the shape and texture of full leaves of lettuce. This drives Jen crazy and makes her kind of cranky when I do this. 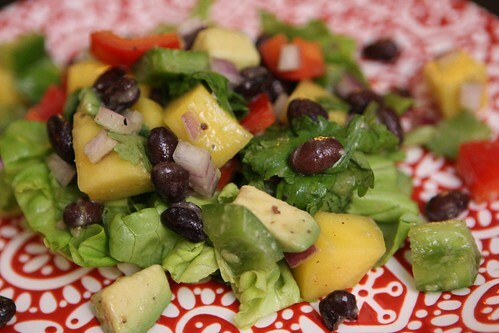 So, for her, I chopped this salad with mango, avocado, red pepper, red onion, butter lettuce, black beans, lime, cilantro, olive oil, salt, and a dash of cayenne pepper. 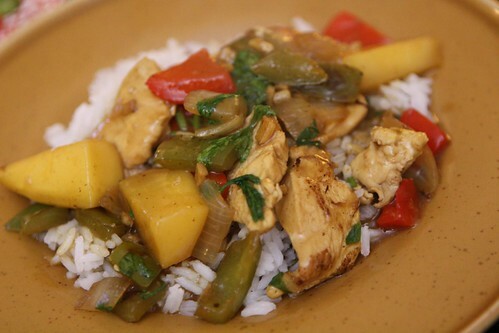 For the main course I made this recipe from Malaysia. Well, sort of. I don't know anything about Malaysia. I've never been there. I probably never will go there. Everythign I know about it I know from No Reservations. But I'm not 100% sure they even did a show there. I browned some fresh ginger and garlic in a little canola and sesame oil. Then I added chopped onion, red pepper, and green pepper. To that I added some chicken, rice wine vinegar, and soy sauce. I let that cook down a bit and then added a little chicken stock, curry powder, and thickened the sauce up with a little cornstarch and water before finishing with fresh cilantro. While mangoes are not exactly at the peak of their season you can usually find a few lackluster ones at your local grocery store imported from South America. These were not great but not terrible. As I've been suffering from an annoying cold I wasn't planning on having anything to drink tonight. Then I remembered the wise words of my sister-in-law who once counseled me on the medicinal properties of beer for fighting a cold. I'm not one to argue with a doctor. With no mango-themed beers readily available to me I had to go with something else. 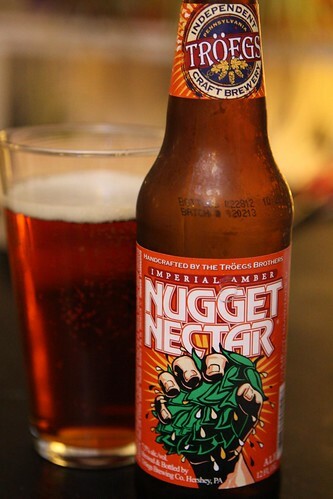 I ended up choosing this Nugget Nectar from Tröegs Brewing Co. This is a seasonal brew from Tröegs which only comes out once a year in February and is generally pretty difficult to find. This particular bottle was bottled on February 28, 2012, so it was particularly fresh, a trait sought after by many an insufferable beer lover. I used to downright dislike any beer calling itself an IPA or playing on the word 'hops' with name like Hopgoblin; Hoppy Birthday; or Hops, Skip, and a Jump. Even though I just made up those three names as I was writing I'm sure all three are beers brewed somewhere. Over the course of the last couple of years I've found my tastes change to the point where I went from disliking these beers, being able to appreciate them, to mildly liking them. Now I actually look forward to a well made IPA. My obsessive nature of trying every beer available to me has beaten out my dislike for bitterness, turning me into someone who actually enjoys IPAs and seeks them out. This beer was probably not the best match for a dish with mango. It had the word 'nectar' in the name and mango nectar is a thing so I figured that this was as close to on theme as I could get. I could tell this beer was good but with my nose as stuffed up as it was I couldn't really make out too much from this beer other than its bitterness. Sometimes if you stretch far enough you can reach the stars. Well, imaginary stars anyway. Yeah, I'm pretty sure we've had enough mango for a long, long time. I'm kind of glad I couldn't find a mango-themed beer now.